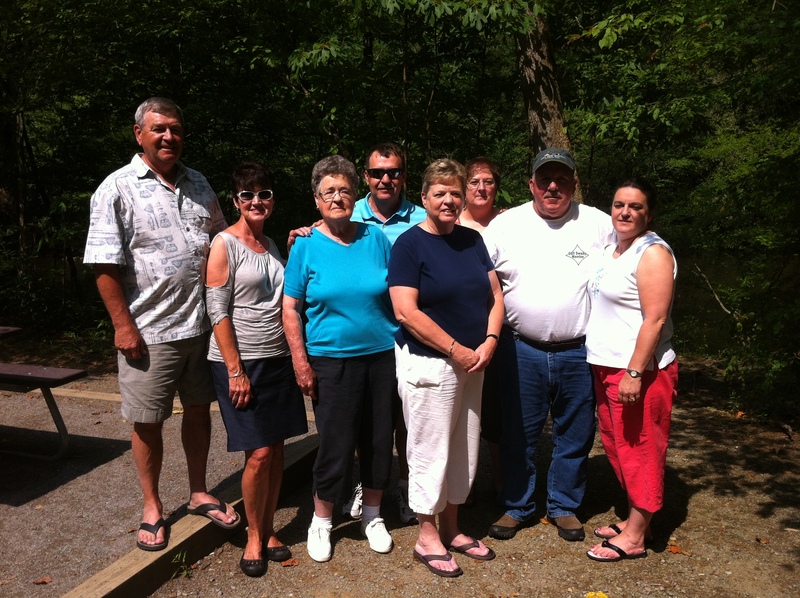 Thanks to the generosity of some of my in-laws, we were able to spend part of the holiday week in the mountains of Tennessee. We arrived in Sevierville on the Sunday prior to the Fourth, and shortly after our arrival, the womenfolk went to the local Wal-Mart for provisions. Just gotta say that I’ve been in several Wal-Marts in tourist areas, but I’ve never been in one as crowded as this one. It was “craxy,” extra crazy. Natrually, I don’t have the time to write about everything we did and saw (and who would want to read it anyway? ), but I do want to record some of our goings-on. So this post is going to be a cross between a journal and a travel diary. Maybe someone reading it will be motivated to go to the Pigeon Forge area and be better informed about what to see and what to avoid. Before chronicling the events and area attractions, I want to put in a plug for exercise. Truly, there’s no better way go see an area than walking. 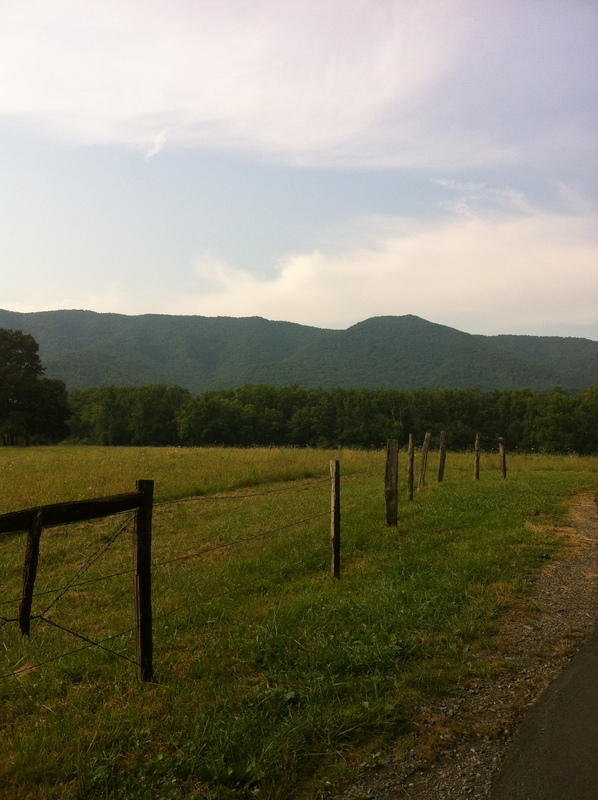 Every morning we were there, I got up early and walked around Sevierville, and because of this, I saw things that no one else in our group did. I particularly enjoyed seeing the nearby Tanger Outlet come to life as the employees came in to work. 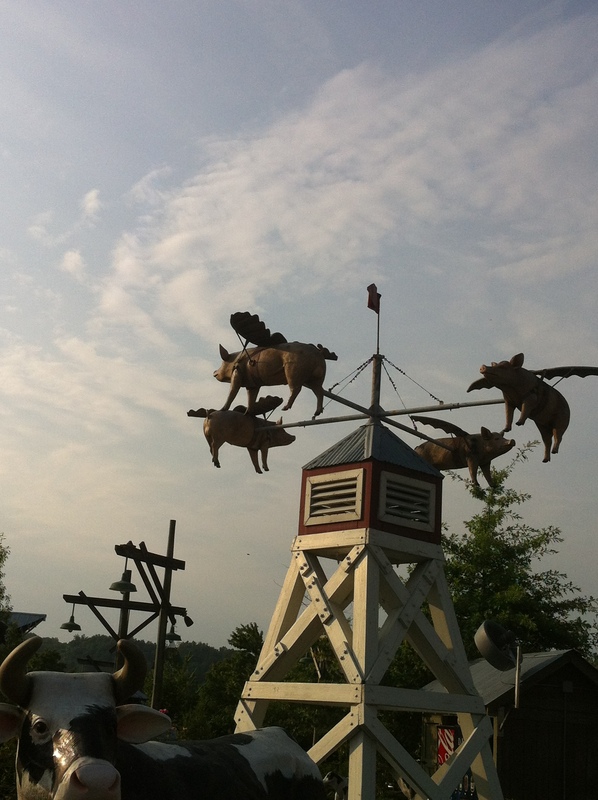 I also saw pigs flying at Old McDonald’s Farm. Plus, I ate ice cream and apple pie without gaining an ounce…carrot cake too. Every day was unique in its own way, but Monday was probably my favorite because we went to the Smokey Mountain National Park and enjoyed some of that “purple mountain majesty.” While the rest of my party enjoyed a film in the Sugarlands Welcome Center, I walked to Cataract Falls and communed with nature. It was a short walk, .4 mile each way, and relatively flat. At the falls, I met some new friends from Florida, Maya and her grandmother and aunt. I took several photos of them posing on the rocks, and Maya took a couple of me. I rejoined the group, and we then traveled through the park until we found the perfect picnic spot. And yes, I mean PERFECT. It even had the proverbial babbling brook (or creek? ), and there were picnickers all around us. Although the temperature was around 100 degrees, we were shaded by magnificent trees that cooled us off a bit. After eating the sandwiches (complete with fresh summer tomatoes) and chips, Tammy and I walked out on the rocks (love her youthful spirit!) to join the other people enjoying the cool mountain water. That’s when I noticed my Florida friends approaching. They too wanted to walk out on the rocks. Naturally, I took their picture again, and they took ours. We packed up the remains of our lunch and headed to Cades Cove. I just have to tsay that although I LOVE the beach, this is an awesomely beautiful area. 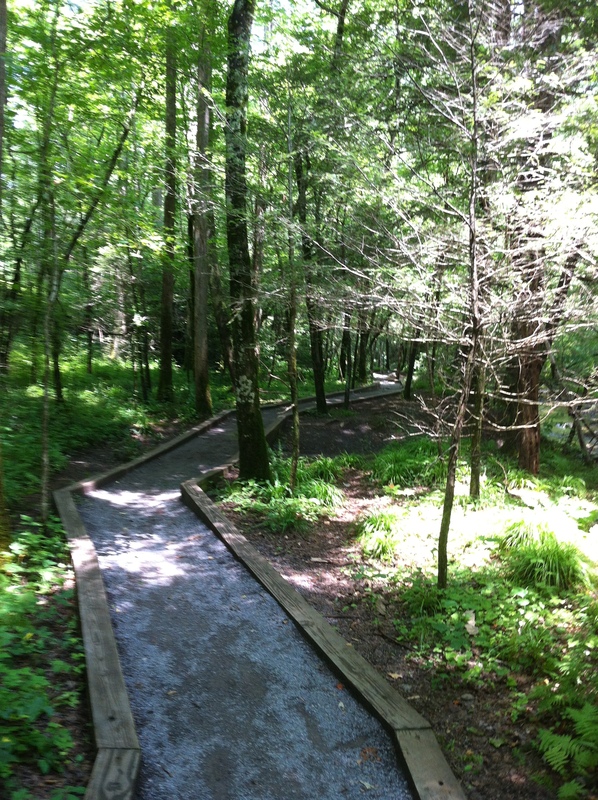 Even though I took several photographs, none do justice to the peaceful, lovely spot in the Smokies. It’s an 11-mile auto tour with several stops along the way. Time prohibited a stop at all of them, but we did visit two old churches and a gift shop disguised as a general store. At the latter location, there were (are) several other structures including an old house and barn. Just walking on the property and absorbing the positive vibes of the place is an experience I’ll always remember. I didn’t want to leave! If you’re fortunate enough to go to Cades Cove and are wrestling with which stops to make along the way, make sure that the churches are among them. 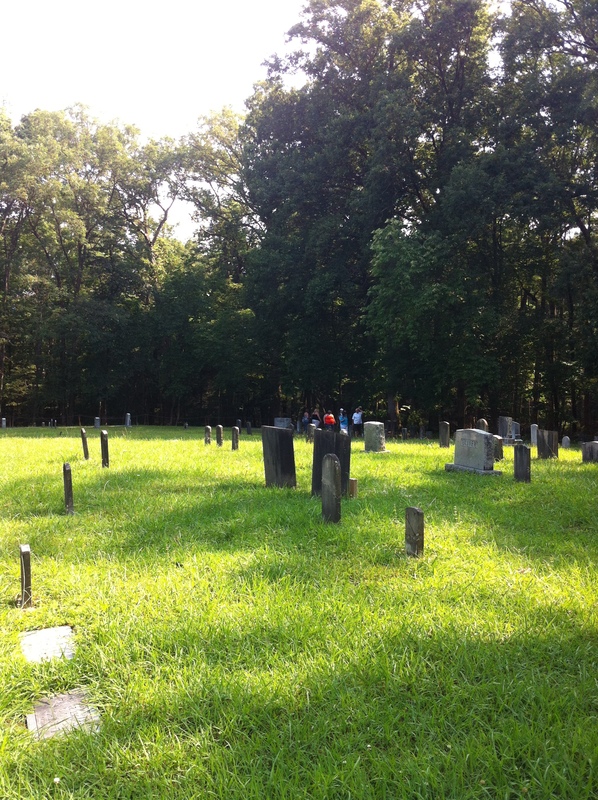 The Primitive Baptist Church has the loveliest resting place (cemetery) that I’ve ever walked through…and I’ve been in my share of cemeteries! Inside, the church was hot as all get out, and I wondered how in the world those worshipers of long ago kept that spiritual feeling going. 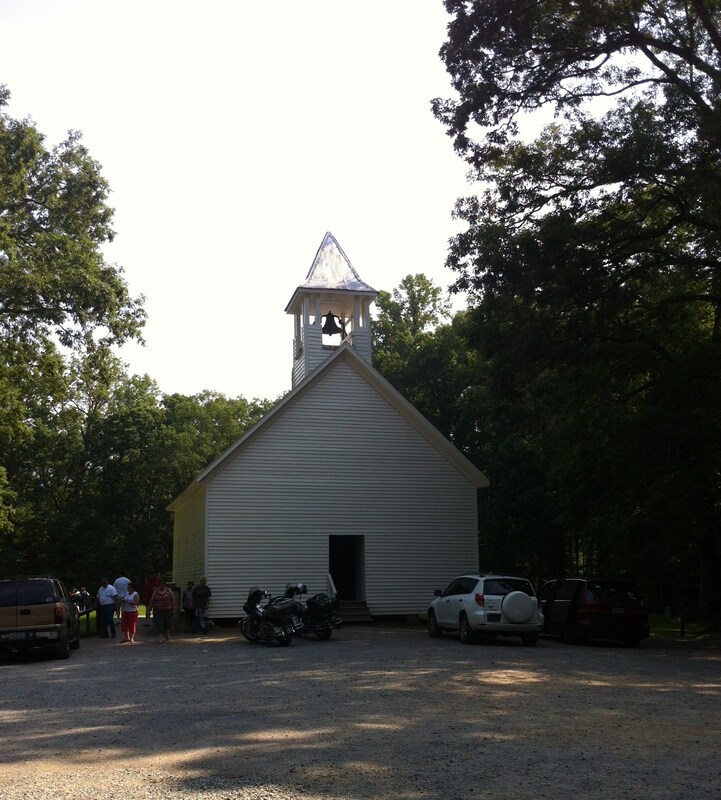 We also visited the Missionary Baptist Church down the road a bit. 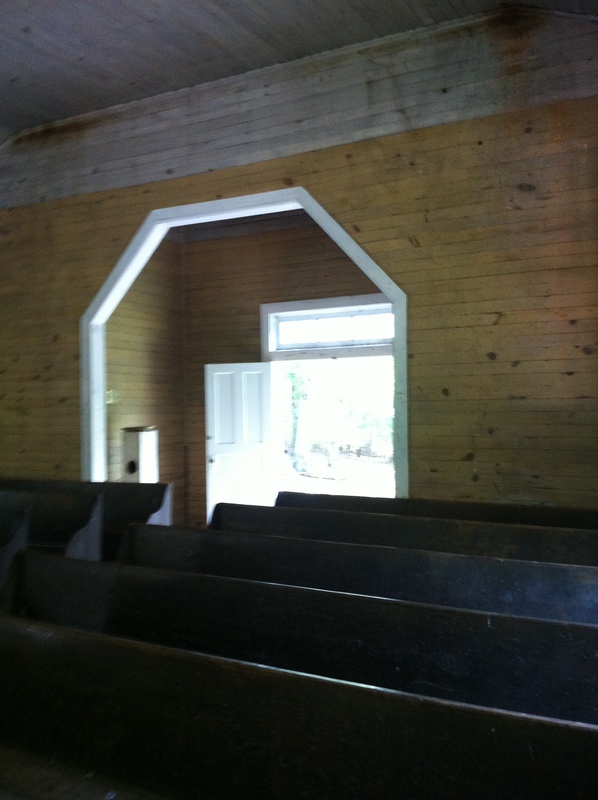 Originally part of the Primitive Church, its members spilt because of a disagreement about whether to do missionary work or not. The second church was a little larger and had wonderful lighting (from the large windows); it even had a small vestibule, and I liked thinking about those long ago people stepping through it on their way to the sanctuary. As the icing on the cake, we even got a little religion that day since Tammy read some verses from John to Karen and me. Interestingly, there were several Bibles and hymnals in each church. Nice. Even the exodus from the park was memorable. The trees, the deer, the turkeys, and the blue haze of the mountains all around us combined to make it an unforgettable ride. Too, being surrounded by my fellow Americans on every side added something to the excursion too! We all especially loved watching the antics of the little boy sitting in the back of the convertible in front of us. Full of life and energy, he kept us entertained. Back at the resort, the men grilled chicken on one of the community grills. After a delicious meal, we watched the Olympic trials and made plans for the next day. Stay tuned for traveler information!